A Rocktopia user review by Woody. This band seems to have come out of nowhere, with their debut album due to drop at the end of October and they are already causing enough of a stir to get a five album deal with Z Records. The principal songwriters are Wolverhampton based guitarist Vince O’Regan (Bob Catley / Eden / Pulse) and American vocalist Phil Vincent ( Solo / D’ercole) joining them to fill the band are Dianno rhythm section Gavin Cooper (Lionsheart) on bass and Steve Hopgood (Jagged Edge) on drums. I’m a big fan of Vince O’Regan a guitarist I’ve seen perform countless times with various bands, but some I’ve my fondest memories are from his performances with Bob Catley. Vince can also write and perform various styles from the softest AOR to the heaviest Metal, a very versatile and talented guitarist. Phil Vincent on the other hand is a singer/guitarist I’ve heard about for many years, think the first time I heard his name mentioned was back in Hard Roxx magazine in 1997. Having said that I can’t tell you a lot about his music, as he’s been an artist I’ve never investigated even though I have read rave reviews over the years, my first real taste of his music was the recent D’ercole album (review coming soon!). 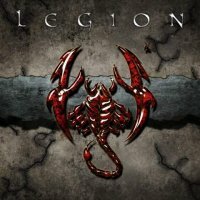 Legion are a Melodic Hard Rock band who are at the heavier end of the scale but still hugely melodic, they put me in mind of some of the harder “Hair Metal” band’s from back in the day like most noticeably Dokken but they will also appeal to fans of the likes of Pretty Maids and the more metallic melodic bands. I’ve become a huge fan of Phil Vincent’s vocal style and he delivers a powerhouse performance throughout the album, the collaboration between him and Vince has delivered explosive results! Vince has created a big full guitar sound and has provided plenty of big hard rocking riff’s full of energy and head banging groove. This is a real return to form for Vince and he has delivered probably his best performances since Bob Catley’s excellent “When Empire’s Burn” album. The dark and heavy rhythm section backbone provided by Cooper & Hopgood have insured that many of the songs on here are destined to become live classics! “Leave Me Alone” has a killer riff from Vince which will imbed itself on your eardrums; the song has lots of power and energy. It has a powerful chorus with great lyric’s from Phil. “Trouble” has another big in your face guitar riff with a real rocking’ groove. A big memorable chorus which really puts me in mind of Dokken and will definitely get you head banging! “Caught In The Madness” is a dark and brooding hard rocker with Phil’s vocal style blending effortlessly with Vince’s guitar work to form a really memorable song. “Coming For You” has a thumping rhythm section which gives the song some real bite. This probably has one of Phil’s finest vocal performances on the album and it has a killer chorus! Slow burning ballad “Someday” is very dark and some great intricate guitar playing from Vince makes the song shine. “Never Be The Same” is instant and catchy as hell, if there was going to be a single this would be it! It has a fantastic riff and the song really grabs you with a great energy and flow which lead you to a big melodic chorus. “Where Were You” has a big driving riff which surrounds some excellent intricate guitar playing, most notably in the verses. In fact this is probably one of Vince’s strongest overall performances on the album! Oh and that hook filled keyboard riff is unshakeable and delicious, coupled with a big shout it out loud chorus makes it a real winner for me! “Too Late” has a great head banging riff, a full force rocker with another fantastic guitar performance from Vince. “Deceiver” is a mid-tempo rocker which is very moody and atmospheric and Phil’s vocal’s fit perfectly with the vibe of the song. “All The Way” has a strong catchy instant guitar riff. A big and melodic song which is very commercial. An absolutely fantastic song with great lyrics, hook filled guitars and killer melodic vocals. Bonus track “Damage Done” a mid-tempo rocker which see’s Phil’s vocals coming to the forefront again especially on the strong chorus. This is guitar lead melodic hard rock with flavours of the past but with a firm ear to the future. Strong vocals, a thunderous rhythm section, big riffs and probably Vince’s greatest guitar performances since “When Empire’s Burn” makes this album a winner with me and should impress and be enjoyed by everyone who likes heavier guitar driven melodic rock. It’s an album full of power and energy and is a thrill ride from beginning to end a real hard rockin’ goodie! I’m really looking forward to how this band progresses especially with album number two apparently destined to be due maybe as early as winter 2011! Hopefully next year will be a busy and productive year for the band with some live dates in the midlands, fingers crossed! Ratings: the higher - the better.